Workday says Platfora buy will bolster its petabyte-scale analysis capabilities. It’s good news for Workday customers, but Platfora customers should be prepared for change. Human resources and financial applications vendor Workday announced July 21 that it plans to acquire big data analytics vendor Platfora. In an echo of an earlier initiative, the company says the deal will enable customers to “analyze petabyte-scale data in seconds,” but existing Platfora customers should be prepared for new priorities. Workday’s first effort to support big data analysis emerged in late 2012, when it announced plans for the Hadoop-based “Workday Big Data Analytics Platform.” When the platform was delivered in September 2013, Workday acknowledged that customers were as interested in small-scale, Workday-internal data analysis as they were in speculative big data opportunities. And by 2015, Workday’s focus had shifted to focused, data-driven “Insights” apps built on the Big Data Analytics Platform, starting with a Talent Insights app. The emphasis was on delivering prescriptive recommendations in the context of applications, not just data visualizations. The acquisition of Platfora, a five-year-old big data analytics vendor, seems in some ways like a reboot for the Workday Big Data Analytics Platform. Platfora works with Hadoop and Apache Spark, providing data-management and governance capabilities as well as its original OLAP-like Platfora Lenses and high-scale data-visualization capabilities. 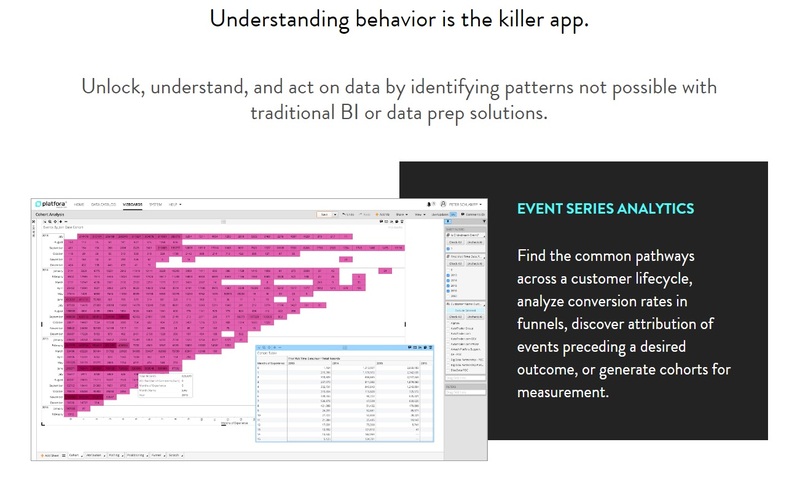 This screen shot from Platfora’s site captures the company’s focus on customer behavior analysis, with examples including path and funnel analysis, attribution and segmentation. What Workday didn’t say is that Platfora is currently focused heavily on customer-behavior analysis, with examples including online path and funnel analysis, attribution, customer segmentation and customer journey analysis. Workday, by contrast, is focused on internal HR and financial analysis. Nonetheless, Workday said Platfora’s tech and expertise will help it support all its customers, including retail customers and insurers doing profitability analysis and consumer goods companies pursuing supply chain analysis and planning. Workday did not disclose the terms of acquisition, which suggest it was a comparatively small deal. Platfora was an early mover on big data analysis, but in many ways it was ahead of its time. Last year there were signs of trouble at the company as it swept in a new CEO just as many new competitors, including Arcadia Data, AtScale and Kyvos, started to emerge. Adding Platfora’s analytical and big data technology and expertise can only be a good thing for Workday, assuming it came at an attractive price. That said, the types of analyses Workday focuses on aren’t exactly in line with the types of “solutions” Platfora specialized in delivering. Shifting focus may take time, but leading software-as-a-service vendors including Workday and Salesforce seem intent on making analytics a part of their platforms. That’s partly a bow to customers, who like seamlessly embedded analytics that are accessible to business users. It’s also a self-interested move to capture more revenue from customers and avoid forcing them to turn to third-party vendors for analytical capabilities. As for existing Platfora customers – a list that includes Citi, Disney, Sears, Tivo and Volkswagen Group – I would be wary. Workday’s statement only addressed advancing analysis on the company’s own, cloud-based platform. It did not say anything about continuing to develop and offer Platfora’s software, which is currently deployed on-premises with multiple Hadoop distributions and on the Amazon, Google and Azure public clouds. That’s a crucial bit of reassurance that existing Platfora customers would expect to hear. A separate Platfora blog on the deal was equally vague, saying only that the company will reach out to customers privately to describe what the future holds. Workday execs were not available for comment. The company said plans will be detailed at the Workday Rising 2016 event in Chicago in late September, but I’m hoping to learn (and will share) more as early as next week.